In my younger days I used to do a bit of hiking and camping in the Sierra Nevada Mountains in California to practice my photography and to relax. That was a long time ago and far away. Now I am dabbling with hiking in the Smoky Mountains here in Tennessee and North Carolina. Being a well-used national park this area has hundreds of miles of developed trails (some more developed than others). One small goal I've set for myself is to hike to each of the major waterfalls in the park. I've made a pretty good start so far although I'm sure that somebody else will come up with a list of a hundred more falls that they see as major which will mean that I've barely scratched the surface. By the way, I've listed trail distances for these hikes but you should be aware that mere distance doesn't mean much at all -- when a trail is covered in roots and rocks and muddy in between, the temperature is near freezing or approaching body heat, and parts of the grade are 50-75% even a short trail can seem infinite. 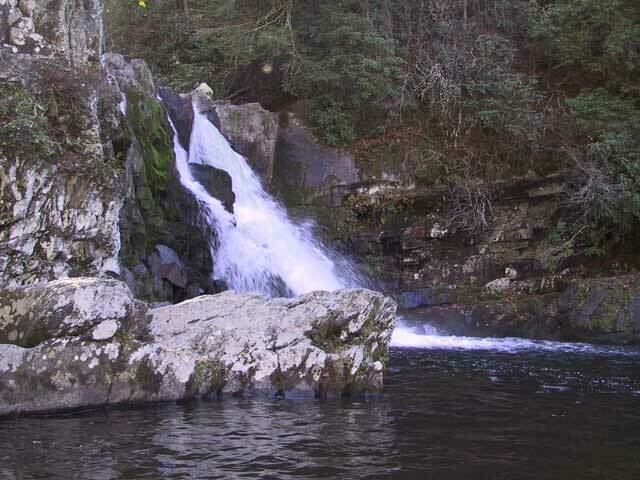 is a 5-mile roundtrip to largest falls, at least in volume of water, in the park. It is accessed at a trailhead at the far end of Cades Cove Loop Road. is a 4-mile roundtrip out of the Smokemont Campground. The trail starts at the furthest end of the campground and follows an old settler's road with a moderate grade. The only real impediments along the way are some muddy patches and the souvenirs left behind by horses that share the trail. 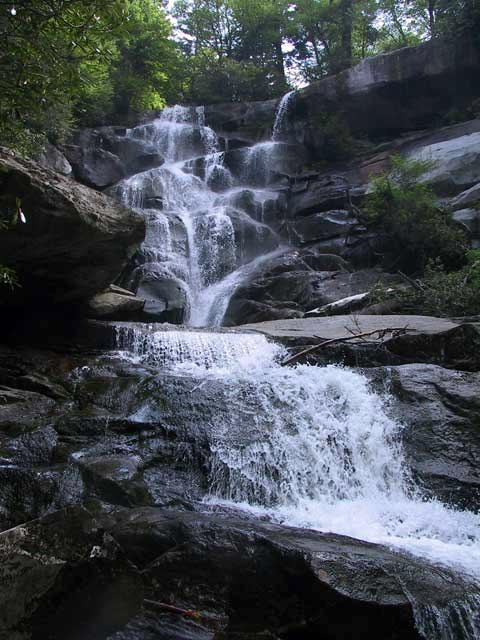 is a 2.4 miles roundtrip hike off of the Roaring Fork Motor Nature Trail to a falls that you can walk behind. Very cooling on a hot day. 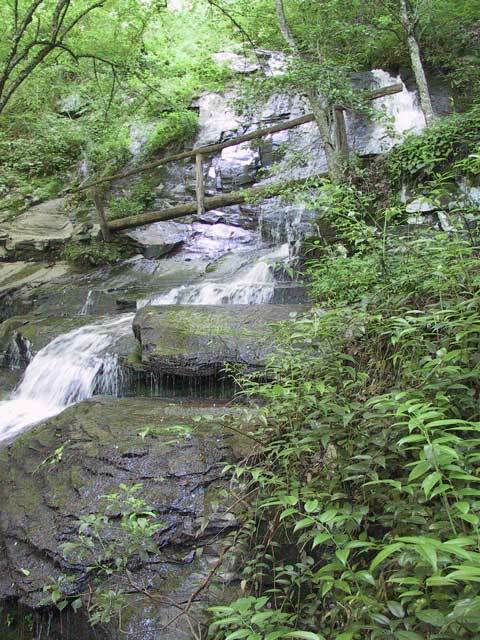 is a 4.4 miles roundtrip on a moderate trail to an uncrowded 45-foot falls near the Cosby Campground. 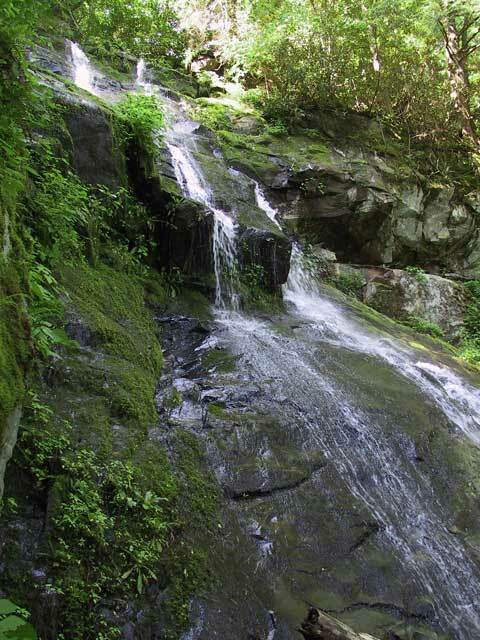 is a short 1.5 mile roundtrip in the Deep Creek Area and is easy, nearly level walking on an old settler road. 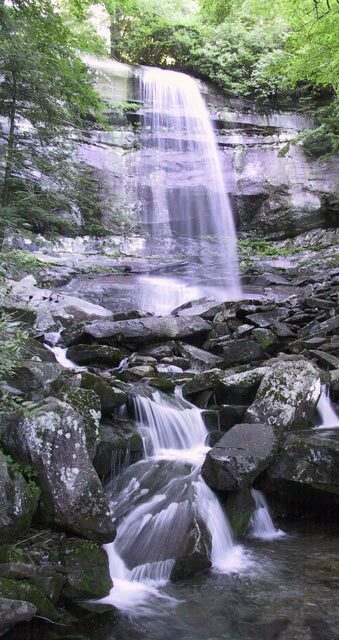 Along the way you will pass Toms Branch Falls as it cascades on the opposite bank of Deep Creek. is a moderate 0.6 mile roundtrip in the Deep Creek Area. This picture shows only the uppermost part of the falls since I did not bother figuring out how to get to the bottom despite knowing it is possible to get there. It seems likely now that the trail at the far side of the log bridge must wind its way downward to make the full span of the falls visible. 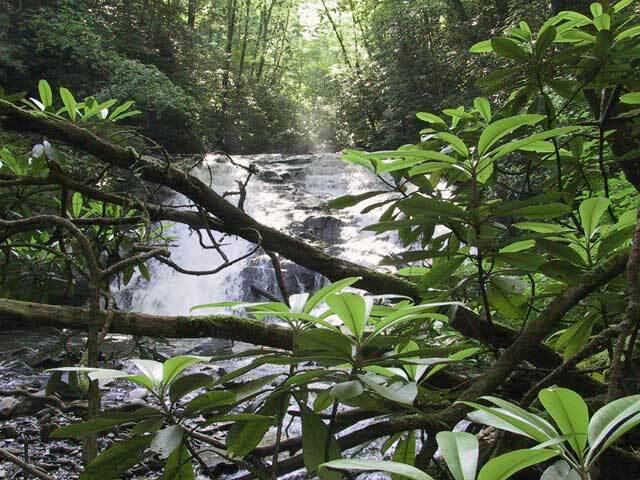 is an easy 2.5 miles roundtrip on a paved trail off of Little River Road to a 70-foot falls. 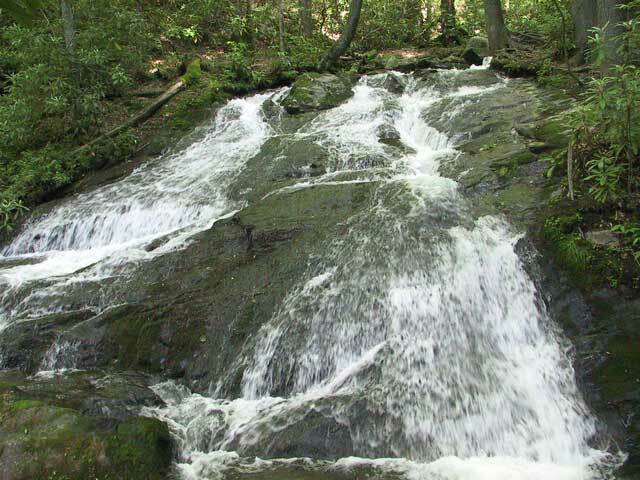 is a 5.4-mile roundtrip to an 80-foot falls accessed from the Cherokee Orchard Road. When I took the first walk up the mountain to see it I discovered that the summer of drought had left the merest trickle of water. The second time I took the walk the water flow was a lot better although still not at the maximum, or so the marks left by old flows would indicate. Given how muddy the trail was getting to the falls at maximum flow might be very difficult. 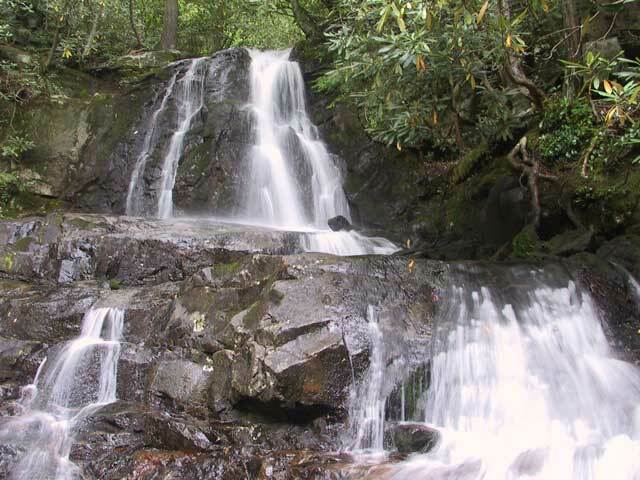 is an 8-mile roundtrip to a rather beautiful 100-foot falls and is accessed from the Greenbriar Area. This trail can be pretty difficult, at least for an older guy with questionable ankles as there are lots of rocks and roots along the way along with a considerable rise. Still the effort is worth it and doable if you take your time as I did. This image was published in the December 2005 issue of Backpacker Magazine. It's almost enough to make me feel as if I know what I'm doing with a camera. 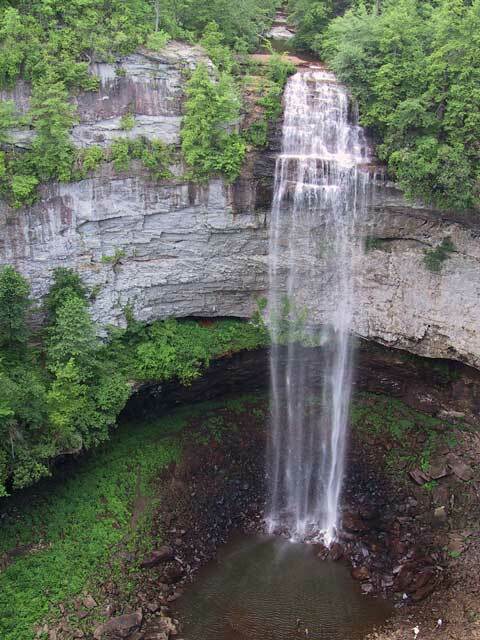 is not a Smokies waterfall, being located up on the Cumberland Plateau, but it is quite spectacular. The view shown here is an easy walk from the parking area and shows off the full 256-foot drop. But on a hot day it is worth the extra effort to hike down the meandering trail to the bowl to enjoy the roar and spray. 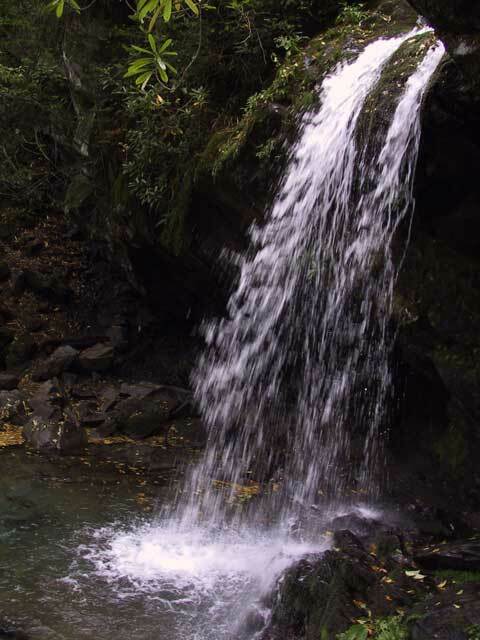 Swimming and wading are allowed and are relatively safe and the feel of the falling water is amazing, if a bit jarring. If you look at the full-sized popup image you can make out some people in the water. A visit to the other falls and cascades in Fall Creek Falls State Park make for an enjoyable day out.